We Get to Know our Neighborhood | Sprezzatura, Y'all! We live in the Borghetto neighborhood. According to the locals, this area is pretty much the way it was in the 16th century. 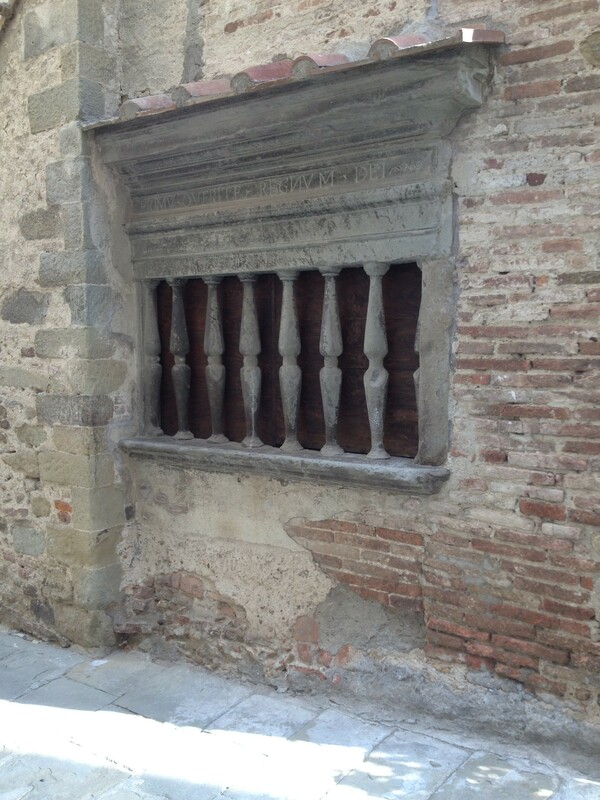 Our little block is a perfectly preserved piece of the Renaissance. Il Borghetto implies the area had developed into a small hamlet within the town. It’s hard to imagine that there could be a hamlet here because the entire town is so small, but I guess in the 1500’s things were a bit different. Regardless of its origins, it’s still very much a community here. We walk all over town and we see people from here everywhere. But right here in our corner of Anghiari we live together. And when I say we live together, we really live together. In the mornings when I wake up I can see my plant watering neighbor from my bedroom window. I’ve seen everyone’s underwear hanging out to dry (we haven’t done that – our underwear is safely hung over the drying rack inside), their tablecloths, their towels, their cleaning rags, the shirt they had on yesterday. Last night before we went to bed, I looked out the bedroom window (in my nightgown) and saw two good friends with dinner guests. We had a nice little conversation through the window and they went on their way and we went to bed. Strange. It reminds me a lot of the old Hitchcock movie, Rear Window, without the murder (I hope). We can hear every cross word, every genial conversation, the evening news on TV. It took us a while to get used to it. It’s odd. It’s as if we have settled into this lifestyle, which is so different from the one we left, and it works for us. We’re used to very quiet in the evenings. Here it’s a cavalcade of sounds – the restaurant below us, the piazza down from us, the comings and goings of the neighbors. Now it’s natural and when we don’t hear the rhythm of the streets we wonder why. Is it siesta time? Just a slow night? Too early for the dinner crowd? Where is everybody? Everyone who lives here speaks Italian and Italian only. We feel so helpless because we can’t speak to them. We try and they try, but we can only get so far. It’s frustrating for us because we want so much to speak this language and talk to people in a way that they can understand. Languages don’t come easily to us so we’re challenged and it’s a constant struggle. We’ve been going to Tandem, a language program offered every Tuesday night at the library. It’s for Italian speakers and English speakers who want to learn the other language. You meet in very small groups, two to three people and speak in Italian for 10 minutes or so and then in English 10 minutes or so. Then you switch and talk with different people. 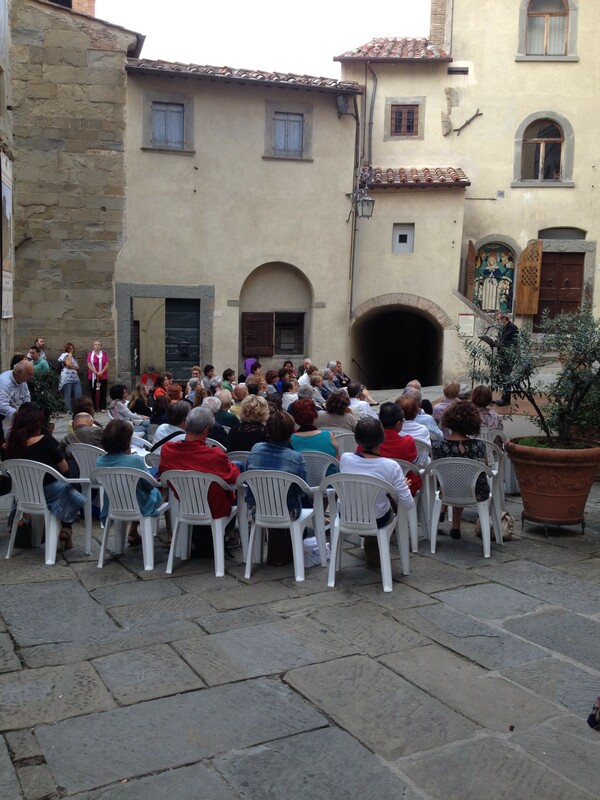 The library is on the main street that cuts through Anghiari and is a beautiful old building. It has many winding passages that lead from room to room of books. 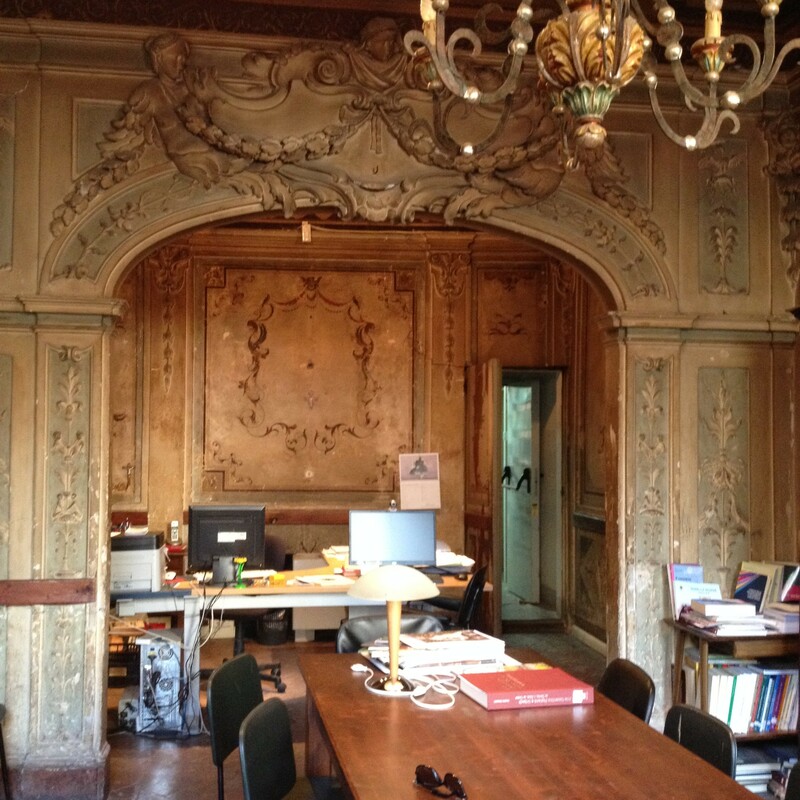 The main rooms are very ornate with chandeliers and frescoes. We meet all over the place. Sometimes in the ornate rooms, sometimes in a little back room with no window. It’s a very inspirational place and we hope that the atmosphere will awaken the long suppressed language genes that I know we both have somewhere. Even the simplest walk around town uncovers great treasures. Things you might easily pass by without notice have such a deep rooted place in history. Anghiari is great about putting up informational signs throughout town explaining the significance of certain things. This helps inquisitive travelers connect with the place. It makes it easy to research further into things that interest you or that you don’t really understand (some of the translations are little tough to follow). Yesterday we discovered this lovely doorway and the interesting little gated window-type thing next to it. 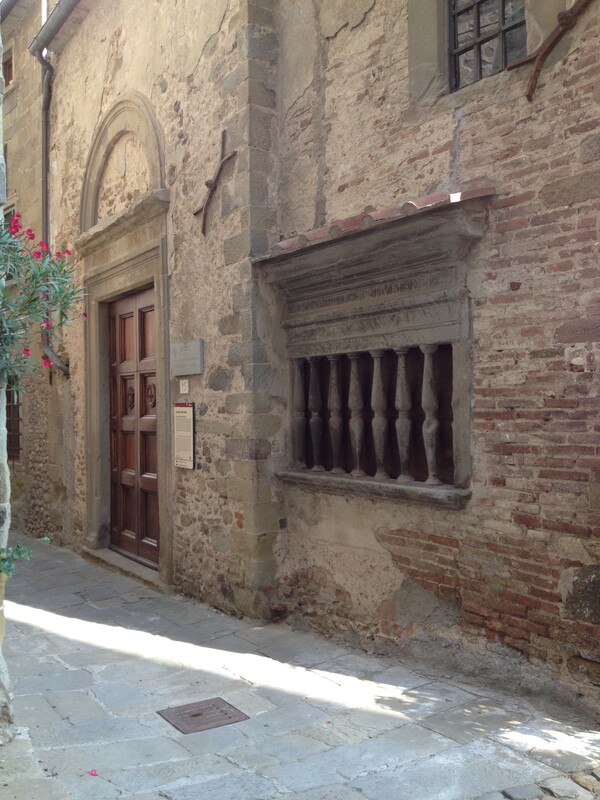 It was the home of the Confraternita della Misericordia, or the brotherhood of mercy. It was established in the 1200’s as an organization to help the needy throughout most of Europe. One of the things they did was distribute bread and the inscription over the “bread window” is Latin for “Seek First the Kingdom of God”. They are actually still in existence, with over 700 chapters active in Europe today. They exist mainly for health care today but their origins are very admirable. So nice that they were a non-profit in medieval times, continuing a long tradition of people coming together to help the less fortunate. There’s a wonderful symmetry between what they were trying to do and what is trying to be accomplished today in the non-profit world. Harkening back to my post on religion, it’s the right thing to do and there are formal and informal ways of doing it. There is, guess what, a festival going on this weekend. Well, it’s a little more highbrow than your ordinary festival. It’s a literary event (think Decatur Book Festival) for Italian authors and it takes place all over the city. Last night was the first night and our little neighborhood hosted an event. We’re not sure exactly what it was, because everyone who came was Italian and spoke only Italian, but we were invited (we think) so we joined in. We saw the area merchants setting up a table in the alley just up from our apartment. We didn’t know what it was for and went on about our business. 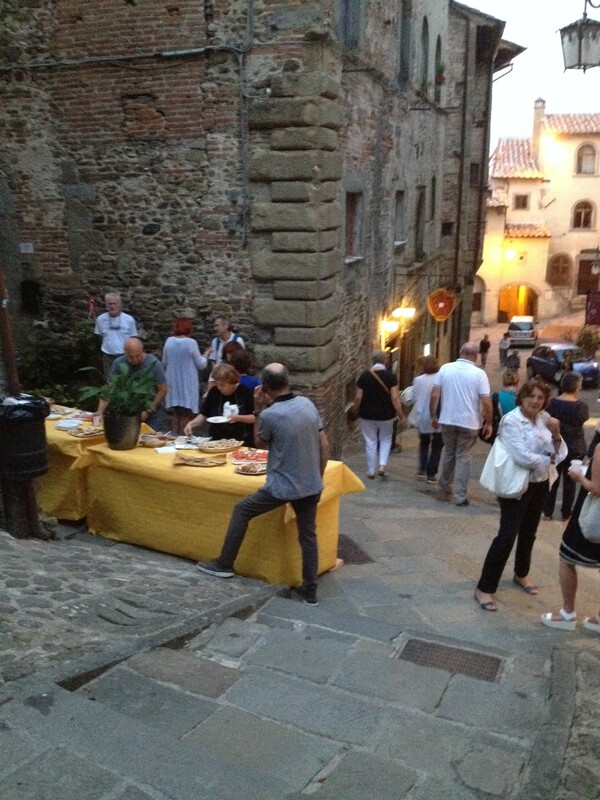 Later in the evening we heard a gathering of people and looked out the window and saw this nice spread of food and wine and people gathering around eating, talking and generally having a good time. Our merchant friends saw us peering down from our window and motioned us down. We see these people every day and they are wonderful to us. But, again, they only speak Italian. Our ability to communicate with them is so limited, but they are so very nice to us and welcome us into everything they do. So down we went and had a little plate of food and said what we could in Italian and had a great time just being there. 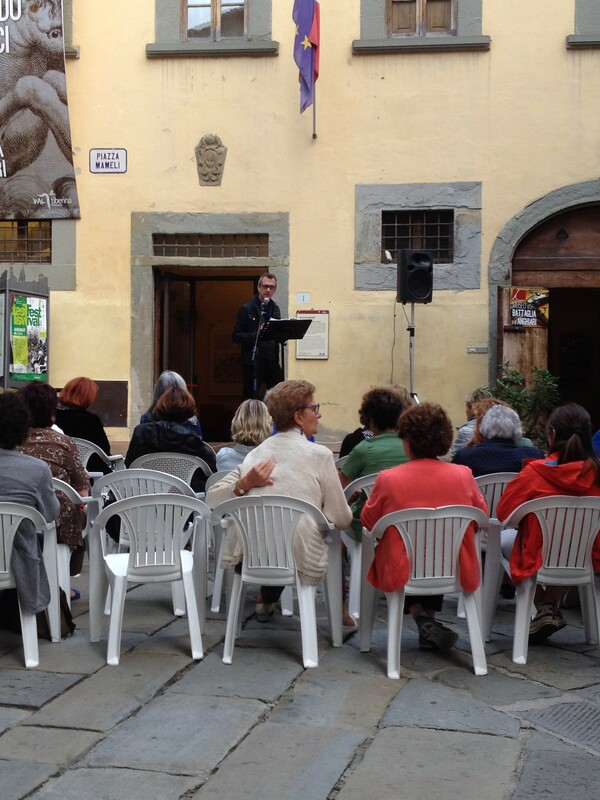 The next night there was a reading in our piazza. It was on violence against women and I told my husband I was glad I couldn’t understand what they were saying because I didn’t want to think about that right now. How very selfish of me to think that way. Because I’m in a state of bliss does not mean that the ugliness of the world will stop. It won’t stop and it will continue despite what I’m doing. In fact, here we are in our own version of paradise and we still see suffering. I don’t want to see it, but it’s there. Just the other day we drove from Anghiari to Arezzo, a nice highway, and at every turnoff we saw the ever-present young woman practicing the world’s oldest profession. The first trip we ever took to Italy, eighteen years ago, we noticed the same thing in northern Italy as we were driving down a similar road. Why were these young women standing at the ends of these little side roads off to nowhere? Oh, we both said at the same time, they’re working. Now they have campers or SUV’s – some still just stand there with no vehicle – but they’re still doing the same thing. I look at them and I realize that the Italy that I’m living in and the one that they’re living in are two different places. They are not doing that because they want to. They’re doing it because they’re made to or simply because they need money. And then I realize that the problems of the poor and less privileged will always be with us and all we can do to alleviate their suffering is to try and help them the best we can. Money, food, a kind word, some encouragement, something to make them feel worthy. That’s what they don’t feel – a sense of worth. So, thank you, Confraternita della Misericordia, for doing what we all should do everyday: help those less fortunate and try to work with them to make a better life. It makes the world a better place for us all. I love this Cathy! I was laughing so hard at the beginning anyway.